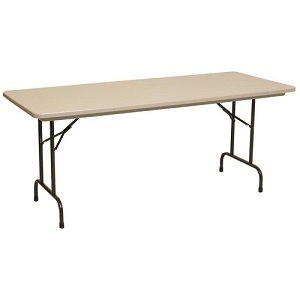 Classroom Table 6' X 18"
Sturdy and rugged table for a variety of uses. We are a family owned and operated business with over 35 years of event planning and coordinating experience. We specialize in party rentals and event rentals to meet every need and budget. From our elegant party tents, to fine china and glassware, to our stylish linens, our fully trained staff is here to help you make your special event truly unforgettable. © 2019 Taylor Rental of Broadview Heights. All rights reserved. Serving Broadview Heights, OH and Cuyahoga, Medina, Summit and Portage counties.